alaTest hat 64 Testberichte und Kundenbewertungen für SPHERO BB-8 with Trainer zusammengefasst und analysiert. Im Durchschnitt wurde das Produkt mit 4.5/5 bewertet, verglichen mit einer durchschnittlichen Bewertung von 4.0/5 für andere Produkte in der Kategorie Camcorder. Am positivsten ist den Testern das Design und die Bildqualität aufgefallen, aber sie finden das Preisleistungsverhältnis nicht optimal. Über die Verarbeitungsqualität gibt es diverse Auffassungen. Wir haben sowohl Nutzer- als auch Expertenbewertungen, Produktalter und weitere Faktoren ausgewertet. Im Vergleich zu anderen Produkte in der Kategorie Camcorder erzielt SPHERO BB-8 with Trainer einen alaScore™ von 89/100 = Sehr gut. Bought as a present for my son (20) who thought it was great. Travels well over carpet and it really is very cute (my opinion). You really need an iPhone for the app to function properly. I love how I can use my phone or force band. I love it when it goes on patrol. It gets excited when the movie is playing too. 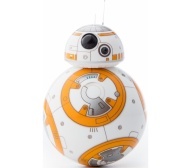 The design on the BB-8 is very good. I think for the price you pay it's ridiculous, it's been used about twice since Christmas, would never buy this product again. Very fun hologram picture and emotion noises, the programming app has a lot of features and it was cool computer programming. It charges quickly and lasts for a long time. It did not start to drive when it was showing it was driving. Did not come with instructions. None that I'm aware of except it was a little smaller than expected. It moves very quickly and is a realistic version of the real thing! It is FAR TOO SMALL for the price, had I have realised just how tiny it is, I wouldn't have purchased it. It would have been far more entertaining if it were larger and could make the noises that it made in the film! Once the novelty has worn off, which took about a morning, this will be unused forever. Doesn't always right itself so head unit on top, needs a little human help - but it's a very minor negative far outweighed by the fun!